If you had asked me what I thought about dumping a bunch of terrified, usless robots in a city that would scream and freak out and threaten to call the police if you touched them, I’d have probably told you no thanks, we’re cool. 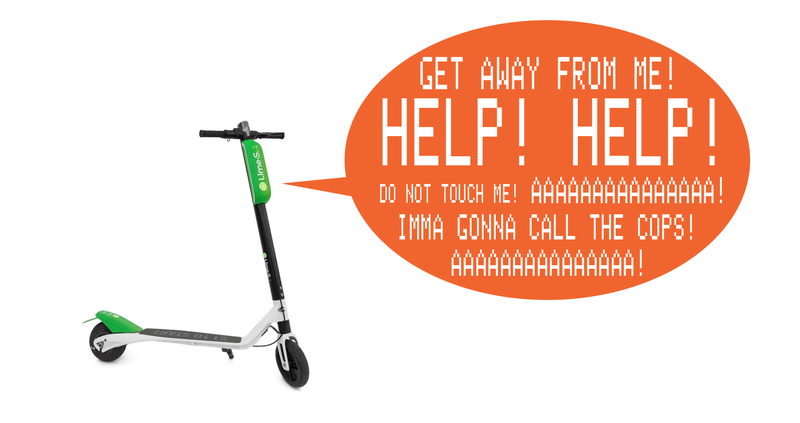 Well, nobody did ask me, and now there’s these rental scooters all over a city and they won’t stop screaming and threatening to call the cops. There’s no evidence they actually call the police. They’re just like some whiny little tattle-tale kid who screams about how they’re going to tell mom just because you looked at them funny. The alarm seems to be triggered by any motion of the scooter without prior payment. So, if you trip over one that’s been left in the sidewalk (because that’s where they often end up) then it’s going to scream at you. I’m hoping the software that controls the stranger-danger/bad-touch freakout also includes algorithms to play alerts like THIS ROAD IS TOO BUMPY OW IT HURTS and maybe YOUR SHOES ARE CHAFING ME GET OFF GET OFF and maybe YOU’RE SQUEEZING MY HANDLEBAR TOO TIGHT I DON’T FEEL SAFE HELP HELP. It’s also worth mentioning that in an era where certain groups of people have been getting cops called on them for all manner of idiotic non-reasons, having a scooter do the same thing just feels even more like tone-deaf tech bro crap.